In November 2004 I was at the Houses of Parliament giving evidence to a Joint Committee concerning a draft new Mental Health Act. I didn’t think I’d still be campaigning for a new Act fourteen years later! But here we are today still subject to an out-of-date Mental Health Act. Despite our vigorous campaigning fourteen years ago we only achieved an amending act which modified parts of the 1983 Mental Health Act. That means our mental health legislation is positively middle aged! In 2018 the UK Government commissioned an independent Review which considered how the Mental Health Act can be improved. The Review published its report last week. While I welcome the report, especially where it aims to remove some of the more oppressive aspects of compulsory treatment, I still don’t believe that the Review has really got to grips with the patient experience of the Act. Over the past few weeks we’ve talked to over 100 service users and carers about what it’s like to be on the receiving end of the Mental Health Act. I look forward to reporting on this consultation in January. Hearing about people’s experiences of the Act has inspired me to start a new campaign to capture the voices and views of service users and carers in Wales. 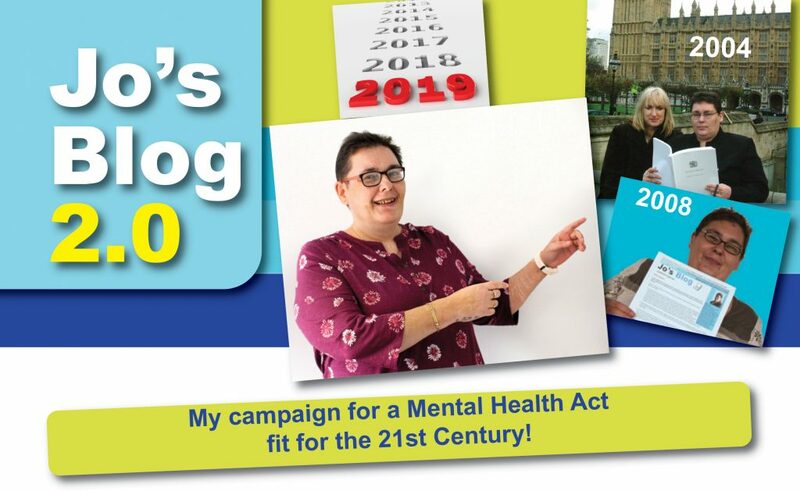 14 years ago I started my own blog – Jo’s Blog – to campaign for vital changes to the Mental Health Act. In the coming months I will be blogging my response to the Government report and its recommendations in my new blog – Jo’s Blog 2.0. I want your help to do this. If you are a service user or a carer, I want to hear your views on compulsory treatment. Together we can fight for a fair Mental Health Act which is focused on the needs of service users and carers, and which works in our unique Welsh context. I look forward to updating you in the new year! I’ll give you my full reaction to the Review’s report and recommendations, and feedback on our discussions so far with over 100 people affected by mental illness.